If you need an edge to finally tackle that photo scanning project you’ve been putting off, this is it. Here are a few tips to help you digitize all your photo collection. Once your scanner is set up, launch the software it came with. These programs are pretty decent and are packed with features specifically designed for scanning photos. First of all, you should change the resolution, known as DPI or dots per inch. If you’re merely scanning the pics to archive them digitally and later share them on Facebook, for example, a 300 dpi setting should be more than enough. But if you are planning to order enlargements in the future then go with 600 dpi instead. Your scanning will take a little longer, but, since you only have to do it once, it might be worth the extra time. Next, check to see if your photo scanning program has an auto-crop feature, which automatically crops several photos from one single scan. This can triple the speed of your scanning project, so make sure to enable it if it’s there. Another essential setting to check is the file output settings. A JPEG format is usually the default, and it’s a great option if you need to save storage space, but you should preferably be using the TIFF file format instead. It has the main advantage of being an uncompressed format, which means that there will be no quality loss when you save the file. You should also adjust the file’s name when saving it. This is important because you want to establish a system at the beginning of your project, so decide how you want to have your photos organized. If it’s by date and event, choose a file naming system that matches it. The last thing to do is to clean your scanner bed to make sure that no specks of dust or dirt will be scanned with your photos. Give it a quick clean with a microfiber towel, and you’re ready to go. 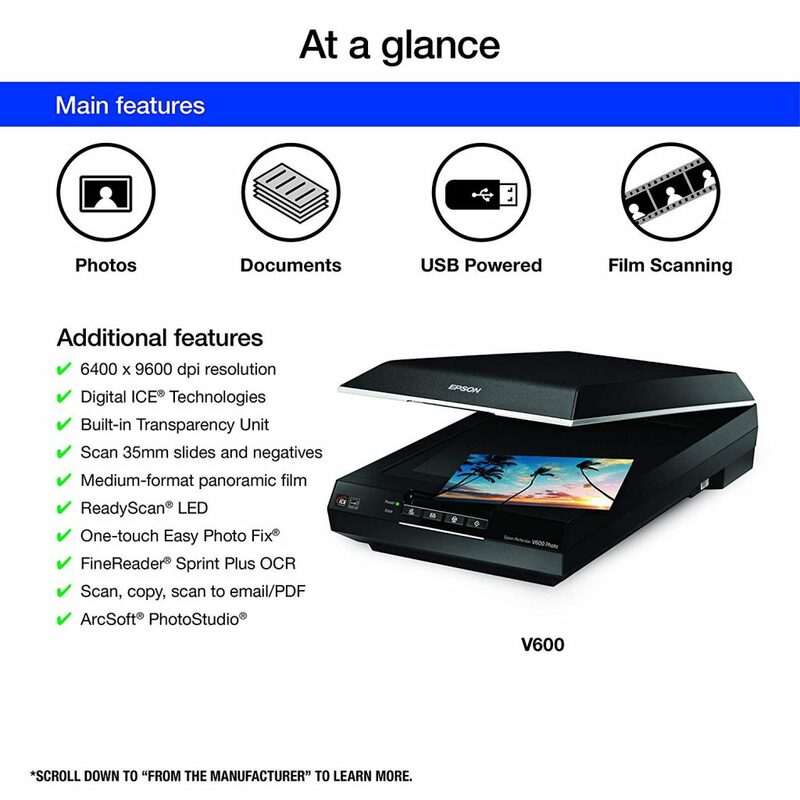 The Epson V600 color scanner is both high-quality and versatile. 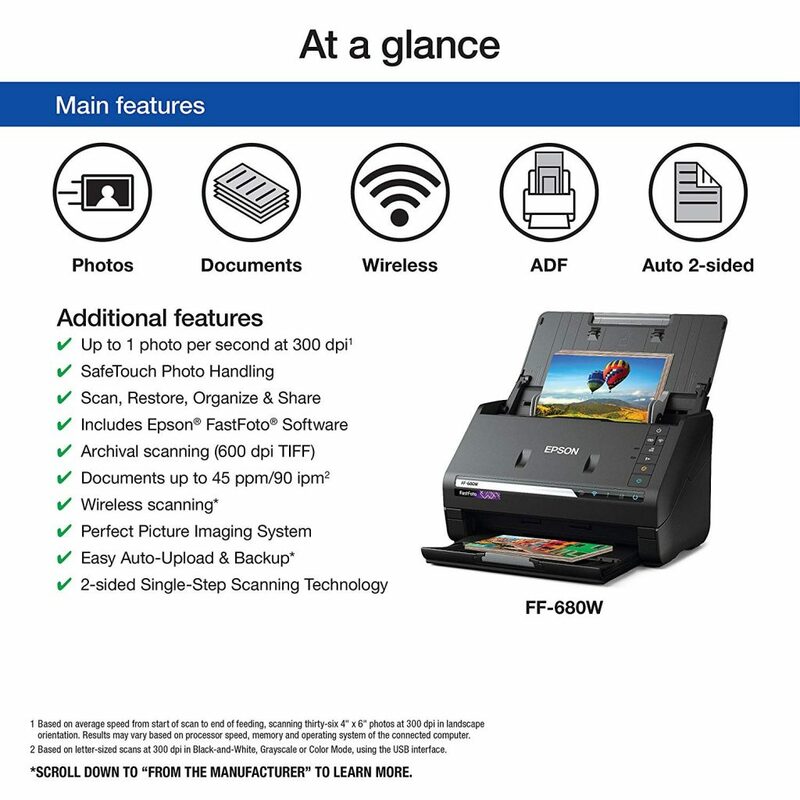 It can scan film, slides, photos and everyday documents with a 6,400 x 9,600 DPI resolution. The scanned images are sharp and vivid and can be up to 17″ x 22″. With the built-in transparency unit, you can easily scan negatives, slides, and panoramic fils in medium format up to 6 x 22 cm. If your pictures are damaged, this photo scanner includes a suite of photo restoration solutions. The DIGITAL ICE technology can remove tears and creases shown on the photos, as well as dust and scratches from film. There is also a one-touch easy photo fix option for color restoration. The Ready Scan feature means that there is almost no warm-up time, so you can start scanning in seconds. Documents can be converted into readable text with the Optical Character Recognition software. 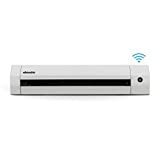 For making this photo scanner suit your specific needs, there are four customizable buttons to instantly copy, scan to email, and create PDF files. 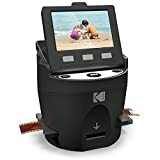 A high-speed USB cable is included, and this photo scanner weighs 9 pounds and measures 11″ x 19″ x 4.6″, so it will easily fit on any desk in your home or office. Don’t want to be tied to your computer? Want to scan on the go? Then this is a great option. The Doxie scanner is a portable solution that can scan paper, receipts, photos, and more with no computer required. The device is quite small, measuring 12.2 x 2.2 x 1.8, similar to a rolled-up magazine. 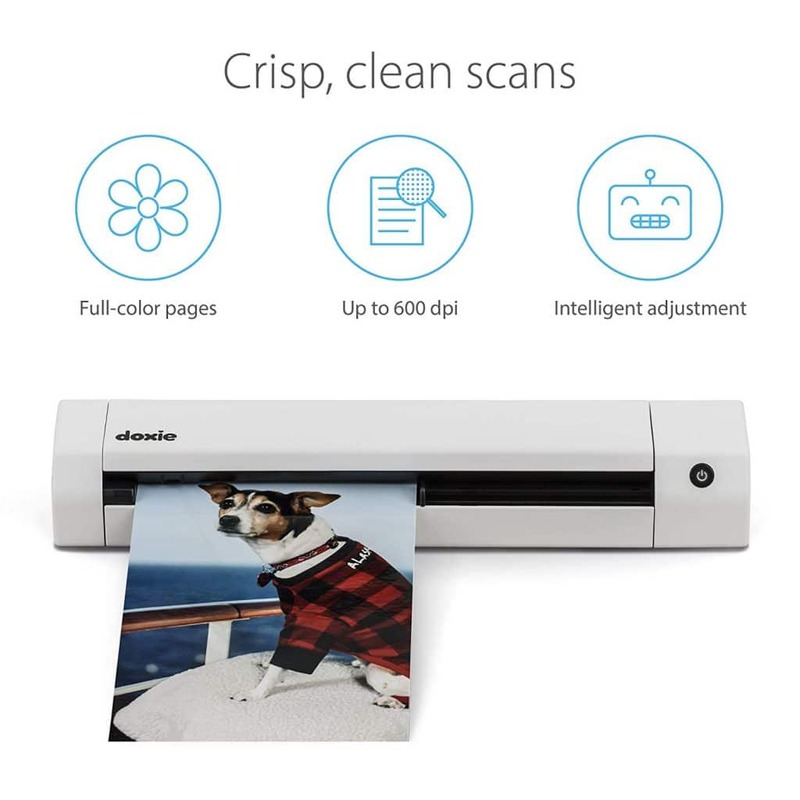 It delivers crisp scans of up to 600 dpi, and it’s AI automatically crops, de-skews, and adds contrast to your scans to make them look perfect. A rechargeable battery is included, which can power the scanner for about 400 scans per charge. Also included is an SD memory card which can store up to 4,000 scans before it needs to sync. Using the scanner’s Wi-Fi, you can sync it to your PC, laptop, and even your cellphone. Your documents will be with you wherever you need them. 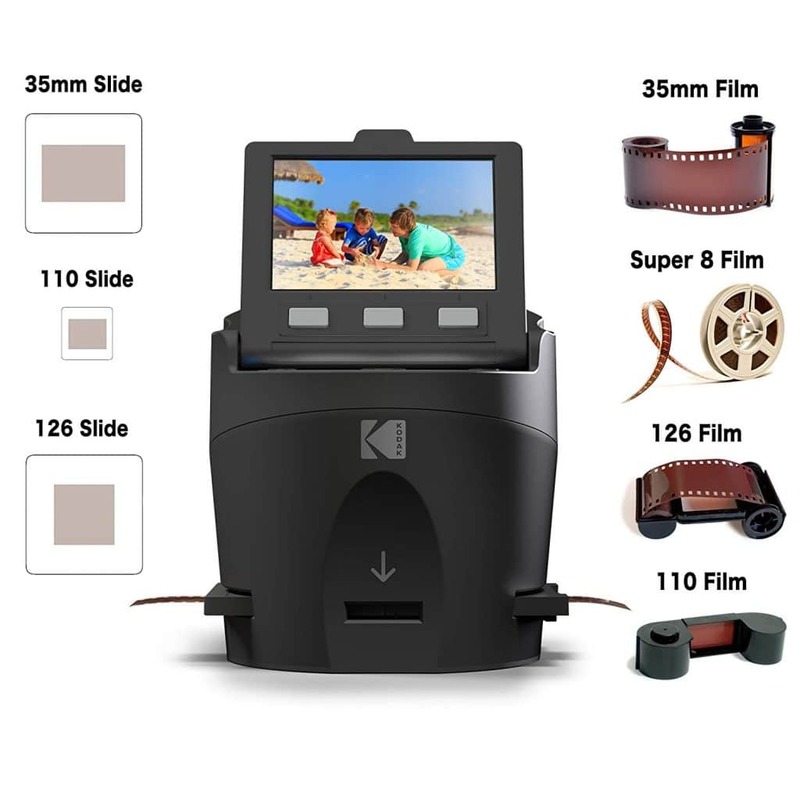 If you have boxes of old 35mm, 126, 110, 8MM or Super 8 negatives or slides, this scanner will turn them into digital files. On-screen instructions guide you to select the proper adapter for each slide and film strip. The large 3.5″ LCD screen makes it easier to operate the scanner. On it, you can view the slideshows and edit your images. A 14-megapixel sensor captures the images in HD quality, while a handy brush is included to clean the scanner of dust and speckles that could ruin your scanned images. The scanner comes with all the cables and adapters needed to connect it to both Mac and PCs. It will convert your film to JPG files in seconds with just pressing a button. Its compact size makes it easy to store and provides excellent portability. The Kodak digital film scanner has built-in TV, USB, and HDMI output ports to connect to a TV, computer, or external devices to watch and edit the photos on a larger screen. For people with lots of photos to scan, this scanner will be a lifesaver. While other scanners can take up to two minutes to scan a photo, this one can scan a 4×6 picture in just a few seconds. To protect old photos, the ePhoto Z300 uses a special soft roller, while the CCD sensor provides the highest degree of quality in image reproduction. You can scan documents in sizes 1″x1″ to 8″x11.5″, and with a thickness of up to 0.24″. Merely insert the photo into the sensor, and the scanner will start its job, with no buttons need to be pressed. All cropping and rotating are done automatically in the scanner’s software, with which you can also restore faded images. Your photos can be saved in JPG, PDF; TIFF, and many other formats, and you can save them in your computer or upload them straight to Facebook, Instagram or other online services. Need speed? Then take a look at this wonder. The FF-680W is the world’s fastest personal photo scanner and can take as little as one second in scanning your pics at 300 dpi. The scanner is flexible enough to support stacks of photos from wallets up to 8″x10″ and can also scan trading cards and Polaroids. 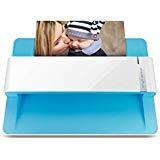 If your photos have handwritten notes on the back, use the Single-Step Technology and automatically capture both sides, with worry-free scanning hardware that will protect delicate images and documents. Your scanned images can be saved to your computer or automatically backed up to an online service like Google Drive, Dropbox or Microsoft One Drive. The powerful OCR technology converts documents into searchable PDFs, and is perfect for tax records, wills, and receipts. Wireless connectivity means that you can place the Epson FastFoto virtually anywhere in your home or office.